Rain fell on The Mountain last night and showered the redbud, forsythia, dogwood, and other large blooming flowers in our yard. 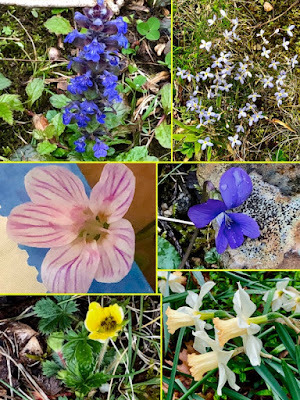 More noticeable on this overcast day are what I call the “littlest flowers” in various hues of lavender, yellow, and deep purple. They will soon take their leave, and I asked resident botanist, Vickie Sullivan, to photograph them so I can enjoy looking at them during days of summer drought. As I am an amateur plant lover and regard botany as Goethe described it — as an “amiable science” — my observations of the plant world in our yard are usually surface descriptions of leaves, flowers, and fruits that often inspire poetry —the language of flowers fascinates me. The rich flora here reveal delicate blooms of a variety of wildflowers, especially during April and May, and the mosaic below shows a few species, which possibly could be classified as weeds that have adapted to the site our home occupies. Vibrant tones of color and delicate designs attracted me as I walked around in the yard, stumbling on mole holes and branches that had fallen during the winter. We live on a property that fronts a small wood, and a deer observed me as I walked through the front yard. I might add that deer are regarded as nuisances in these parts and are culled annually. I don’t know if they lunch on the littlest flowers, but I doubt that they have an appetite for these blooms as the flowers seem undisturbed by animal life. Photographs were taken by Victoria Sullivan.